Initial August home sales numbers were just released by Florida Realtors and it reveals some encouraging yet predictable figures. Single family home sales in Lee County Florida showed a median price increase of 10.6% over last year to $182,500, while the average sales price was up 6.3% to $261,011 The median price was up from July $179,900. 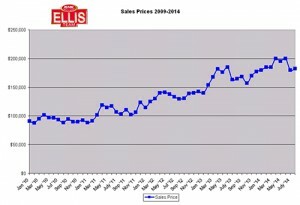 If you’ll notice last year prices began rising again in August as well. 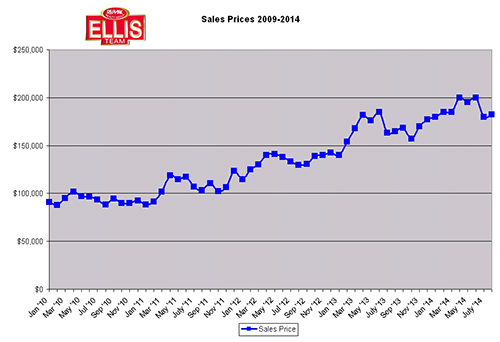 There is seasonality in the SW Florida real estate market and the graphs help illustrate how this works. Listing inventory is also down this year with only 4,890 single family homes on the market. Last year there were 4,997 so inventory is going down. You can see from the total inventory graph that there is always a dip in inventory this time of year. Making predictions is easy if you have lots of historical data to look at and graphs. We always have to look at external factors that could influence the market going forward and combine that with market data. If no new external forces were influencing the market, where would you predict inventory levels in a few months? If you predict inventory levels to rise, there’s a good chance you’ll be correct based upon the last 3 years of data. If we provided a price graph you’d see prices begin escalating after September as well, so going forward we could have rising inventory and rising prices. Let’s look at external forces that could influence the market. The Feds could increase interest rates which has a negative effect on buyer’s purchasing power. This could happen in the next 12 months. We have elections coming up in November. Depending on how they turn out could affect consumer sentiment about the economy going forward. The war on terrorism, along with hot spots in Ukraine, Iran, Syria, Iraq, Libya, and elsewhere could affect the world economy and impact us here someday. Locally we’re expecting an announcement regarding a company relocating to SW Florida. It is dubbed Project Orange and the announcement should come in the next 12 months. Should they choose Lee County we hear Bonita Springs is the likely winner. This could positively impact Southern Lee County and Northern Collier County, however landing a company with jobs helps the entire area really. Builders will be bringing more inventory to SW Florida in a few months, and we need it. Buying new construction is complicated. It’s hard to know who has the best deal and what incentives are being offered. Hooking up with a top Realtor in the area can save you big and Realtors can offer guidance on what areas are hot and what amenities future buyers are looking for. Purchasing in the best area for you can help secure your financial future down the road. Good Realtors know what to stay away from and what will be hard to resell later on, so having a Realtor with you when you purchase is critical. You don’t pay extra from a builder to have a Realtor, but not having one can cost you thousands. We know which builders and which communities have product coming and when, so give us a call if you’re in the market for a home and can’t find it on the resale market. Posted in Cape Coral Real Estate, Fort Myers, Fort Myers Real Estate, Southwest Florida Real Estate.Tagged Lee County Florida, SW Florida real estate market.